A new practice test question site, Learningpod™, launched yesterday with 20,000 questions in its database and more on the way. The Saylor Foundation is among the founding contributors to the site, along with Kaplan Test Prep, Manhattan Prep, OpenStax College, National Assessment of Educational Progress (NAEP), and the Council for Economic Education. One tough thing for education organizations, teachers, and students alike is developing a lot of good practice or exam questions. Learningpod lets anyone build “pods” of questions to share, but organizations and developers win, too: the platform comes with an API so that other applications can tap into this vast question bank. And that’s just what we plan to do. Devon, our special projects guru, mentions that he’s excited for an impending possibility that we can write new test questions in the Learningpod environment (making them widely available for others to use and practice with) and port them back to school.saylor.org for our students to use. Our first contribution is a unit assessment from POLSC231: American Government. You can try your hand without needing to sign up by clicking on the image. 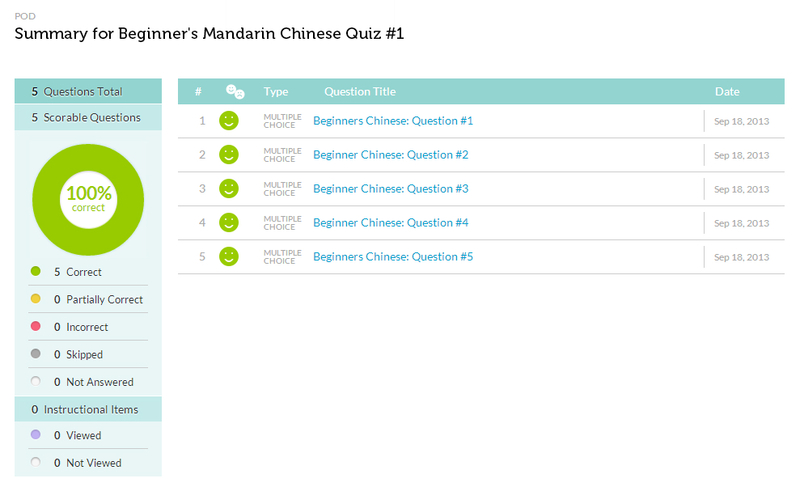 As for the author, he did okay (like, around 100% or so…not a big deal) on a five-question Mandarin quiz (and there are plenty more pods to cruise through on the homepage). We’re looking forward to a fruitful collaboration with Learningpod, but while we ramp up our contributions to the site, we encourage you to visit, practice, and have fun!